(Editor’s note: This 37th contribution to The Rap Sheet’s “Story Behind the Story” series brings back Northern California author Keith Raffel. This is, in fact, his third “Story Behind the Story” essay. He wrote previously about his 2009 Silicon Valley novel, Smasher, and his 2011 political thriller, Drop By Drop. Below, Raffel traces the inspiration and research that went into his new work of speculative historical fiction, A Fine and Dangerous Season, which is available from Amazon as well as from Barnes & Noble. Read an excerpt from the novel here). Who knew that future president John F. Kennedy had spent the fall quarter of 1940 at Stanford Business School in my hometown of Palo Alto, California? 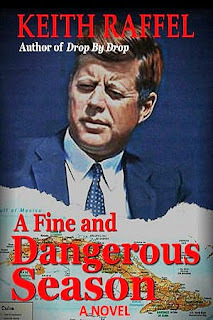 Well, once I found out, I asked myself the two-word question that all thriller authors ask: “What if?” What if during his time at Stanford, JFK becomes fast friends with someone from a completely different background who is Jewish, not Catholic, San Franciscan rather than Bostonian, with a famous left-wing father, not a buccaneering capitalist one? And what if JFK and this fictitious character, Nate Michaels, have a falling out? Kicking around these ideas with college pal Rick Wolff, he asked the best “what if” of all: What if JFK needs this guy’s help 22 years later during the Cuban Missile Crisis? In the fall of 1940, Kennedy was just killing time at Stanford. He’d already graduated from Harvard College. His book Why England Slept (based on his senior thesis) had hit the bestseller lists in the spring. He figured war was coming, and he’d enlist. His father, the formidable Joseph P. Kennedy, Sr., the American ambassador to Great Britain, wanted him to go to Yale Law School. But his older brother’s college roommate had expounded on two major differences between Harvard and Stanford--the weather and co-education. That was argument enough to make JFK beat it to Palo Alto as a special student at the business school. What better place to hang out? I could empathize with “Jack” Kennedy. After graduating from college, I was trying to figure out what to do as well. To get far away from my hometown (which, after all, is Palo Alto), I headed over to England to study history. Good decision. I am just now realizing that what I loved about studying history is the same thing I love about composing thrillers. In both, I get to look at how people react to an emergency, a time of high drama, and how they show courage--or not. That’s a theme I explore in my new e-book, A Fine and Dangerous Season. Using primary research whenever possible, I try to fit the events of the novel into the interstices of the historical record. As a first step, I drove by 624 Mayfield on campus where Kennedy lived in a guest house that he rented for $60 per month. (The house is long gone.) JFK used to head down to Los Angeles, too. In his 1980 memoir, Straight Shooting, actor Robert Stack of The Untouchables fame describes how JFK took advantage of Stack’s “little pad” on Whitley Terrace for rendezvous with various Hollywood starlets. At the Palo Alto Library, I found old menus from JFK’s favorite hangout, L’Omelette. The prices seemed reasonable enough--a quarter for a martini and six bits for a French lamb chop dinner! I discovered JFK’s favorite courses at Stanford weren’t business classes at all, but--no surprise--courses on politics and international relations. From the archives of the student newspaper, The Stanford Daily, I learned that the closest call in Stanford’s 1940 undefeated football season came against the University of California, Los Angeles, where a fellow named Jackie Robinson almost beat the Stanford team single-handed. Back at the Kennedy Presidential Library in Boston, I found a teasing and witty letter from Kennedy’s Stanford girlfriend Harriet “Flip” Price, who chided, “You wouldn’t exactly win a prize for the world’s best correspondent.” I got the biggest kick of all when I came across the schedule of movies at the Stanford Theatre--which, amazingly enough, is still showing great films from the 1940s in downtown Palo Alto. In one scene of my novel, set on a Saturday night in October 1940, my man Nate and his girlfriend eat popcorn and hold greasy hands while the movie showing is The Quarterback. Wayne Morris plays twins, one a star football player without too much upstairs and the other an egghead studying to be a professor. Inevitably, both loved the same girl, an oblique metaphor to what was happening in the “real life” laid out in my book. Now, how was I going to find a role for Nate Michaels in the 1962 Cuban Missile Crisis? I remembered from a college course that John Scali, an ABC News correspondent, had opened a back channel during the crisis with a known KGB agent in Washington, D.C. In the history of that crisis, as recounted in Fine and Dangerous, Scali was out and Nate was in. Back in the 1930s, a Soviet consular official in San Francisco named Maxim Volkov had kept in touch with potential sympathizers like Nate’s own father, a lawyer for the communist-leaning Longshoremen’s Union. Now, in the 1962 of my novel, Volkov is head of the KGB in Washington, and JFK needs Nate to reach out to him to see if there is a way to stop the headlong rush to nuclear war. Doing the research on the Cuban Missile Crisis itself was much easier than the work I did on Stanford in 1940. Few modern events have been more scrutinized by historians. With my preference for primary sources, I relied on the book The Kennedy Tapes: Inside the White House During the Cuban Missile Crisis, some 500 pages of word-for-word transcriptions of administration deliberations. That volume was co-edited by the late Ernest R. May, a great historian and a favorite college professor of mine. Thanks to May’s work, characters in my own book could use the same words they’d spoken in 1962. The only difference is that I place Nate in the room sitting just behind JFK. I kept a book called Designing Camelot: The Kennedy White House Restoration next to me as I wrote to ensure that I accurately described White House rooms and the labyrinthine passages between them. It was much easier to get the architecture of the KGB safe house right. As a model, I used the house on Swann Street NW in D.C. where I’d lived myself for three years. Online, I found snapshots of the Steuart Motor car dealership in the nation’s capital, where U2 reconnaissance photos of Soviet missiles in Cuba were in fact analyzed. A person in the parish office at St. Stephens Martyr Church told me there is a little brass plate on her building, noting that JFK frequently worshipped there. One early reader of my manuscript suggested that the flight from Washington to San Francisco that Nate catches at the end of the book seemed too short for half a century ago. Nope. Fifty-year-old flight schedules show that 707s high-tailed it across the country faster than today’s advanced jetliners. Oh yes, airplanes. In the midst of the Cuban Missile Crisis, Nate frequently harks back to his years flying bombers during World War II. When a B-17 Flying Fortress showed up at Moffett Field, just a few miles from my place in Palo Alto, my son and I hustled down there and crawled through the plane. I spent more than my fair share of time squeezed into the pilot’s seat and then came down to chat with B-17 veterans who recounted in unadorned words what it was like on those long, cold flights from southeast England to targets in the German industrial heartland. Certainly, the risk in writing a historical thriller is losing the thread of the plot and making readers feel that they are being subjected to a graduate thesis. Believe me, I did try hard not to make that mistake with A Fine and Dangerous Season. I promise I murdered lots of darlings. Still, the magic of writing this book transported me right back to Palo Alto in 1940 and the White House in 1962. 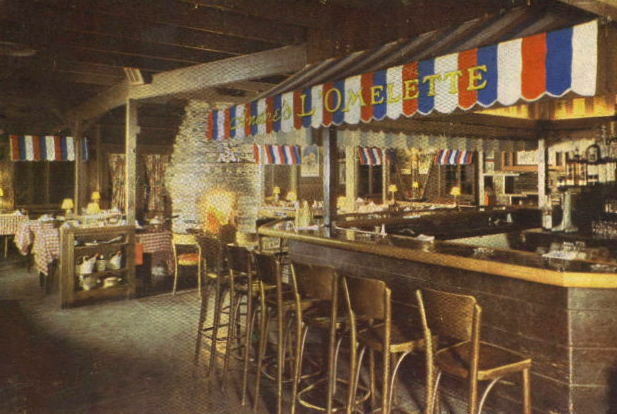 Even today, when driving down El Camino Real in Palo Alto, I pass the corner where the old L’Omelette stood and see a hazy outline of John F. Kennedy at the bar surrounded by a passel of admiring women.